diskant » Blog Archive » New stuff on diskant, and a giveaway! New stuff on diskant, and a giveaway! Even though I am up to my eyeballs in diskant party planning, I still find the time to give you new interviews to read. It’s amazing isn’t it? First up is a long-overdue Talentspotter profile of the lovely SUNNYVALE NOISE SUB-ELEMENT who have just released an album of live tracks and remixes and will be bringing their own particular brand of genre-defying experimental electro-rock all the way from Oxford to our 10 year anniversary party (THIS FRIDAY!). In the other corner is the mighty WIL FORBIS, Acid Logic founder, musician, diskant columnist and general good guy. No wait, bad guy. Oh, whatever. With his book just published and his Bargain Bin Culture columns dusted off and re-posted on diskant, I thought it was time to catch up with the man himself. It’s a pretty damn good read if I do say so myself. 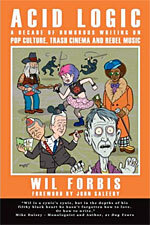 Wil has also kindly offered up a copy of the book and his latest CD for a giveaway right here on diskant. Just leave a comment on this post and I’ll get Wil to pick someone as a WINNER in a week’s time. Flattery is probably the way to go. All joking aside, this really is a fantastic book so get on it, or buy your own copy by clicking on the image to your right. Posted: 08|3|08 at 10:35 pm. Filed under: diskant, overlord updates. 5 Responses to New stuff on diskant, and a giveaway! This sounds great. Thanks for the chance to win it. Curtis Armstrong – that is TOO COOL!!!!!! Having performed in over 25 shows with this man in “Doctor Zoom” a Seattle funk-rock band from the 90’s, I can tell you that the “Mighty” in front of Wil Forbis’ name clearly relates to his talent as a songriter, musician, philosophist, satirist, and psycho-female types that seem to always be attracted to him at some point in his life. He is a hero of mine and it pleases me very much that he has attained such success with his latest contribution to the planet. Can I have my free book now? In all honesty, Wil is driven to expose everything and anything that others miss in their 24/7-365 world of texting, cyber-surfing, e-mailing, iPhoning, Xboxing, ET-watching lives. All at the same time while composing new ditties on his banjo, which I personally can’t wait to indulge in. I am grateful to live in an age where someone like the “Mighty” Wil Forbis can communicate to the masses his insightful thoughts through verse after verse. I wish him much success, wealth beyond his wildest imaginations, and 78 virgins who aren’t ready yet to audition for another movie like “Girl, Interrupted! Peace to you Wil! Now send me my free book dammit!